Eileen R. Tabios' new collection. 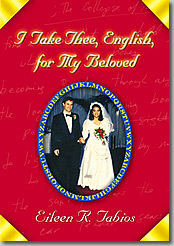 I Take Thee, English, for My Beloved, contains and melds the forms of poem, memoir, art monograph, play, novel and questionnaire. Here are four discrete collections that would stand on their own but which, together, form the vibrant expanse of a book that affirms: not only does this poet and writer speak English but she loves English. Although Tabios' first poetry collection received the Manila Critics Circle National Book Award for Poetry in the Philippines, where she was born, she has lived for over three decades in, and is a citizen of, the United States. The initial impetus for this collection stemmed from her meditations on being fluent in only one languagebut a language that colonized her birthland and about which she is still asked the question by strangers as she travels throughout North America: "Do you speak English?" This bespeaks the consistent "Other"-ing experience imposed by many on people of color, even second- or third-generation Americans. Nonetheless, Tabiosa "transcolonial" poetrefuses to allow adverse socio-political elements to deter her from what she feels she must do as a poet, particularly as a poet of eros: to love her raw material of English. From such love, she not only crafts poems denoting a unique vision, but writings that transcend inherited literary forms. Tabios considers the term "transcolonial" to describe a postcolonial perspective that goes beyond the referenced context of colonialism. One result is the "hay(na)ku," a poetic form which Tabios invented as a community-making gesture; here, the community encompasses both Filipino and non-Filipino poets gathered together through a love of Poetry. This collection features the first publication of "The Official History of the Hay(na)ku." This collection ends with a close reading by respected poet Ron Silliman of one of Tabios' poems. Silliman concludes, "Tabios tries for more in one page than many other poets would attempt in 20. And she pulls it off." EILEEN R. TABIOS has released a poetry CD; three e-poetry collections; and written, edited or co-edited fourteen books of poetry, fiction and essays since 1996 when she traded a finance career for poetry. She is also a community-oriented conceptual artist who pens the poetics blog "The Chatelaine's Poetics" at http://chatelaine-poet.blogspot.com; who invented the "Hay(na)ku" poetic form; and whose "Poems Form/From The Six Directions" project has been exhibited several times in California. In 2006, she will release a new poetry collection, The Secret Lives of Punctuations, Vol. I.